Midday in Rye, East Sussex, and it’s started to rain. Late-season tourists are reaching for their waterproofs and heading for indoors, leaving the churchyard that only a few moments ago was packed, a guided tour in full swing. 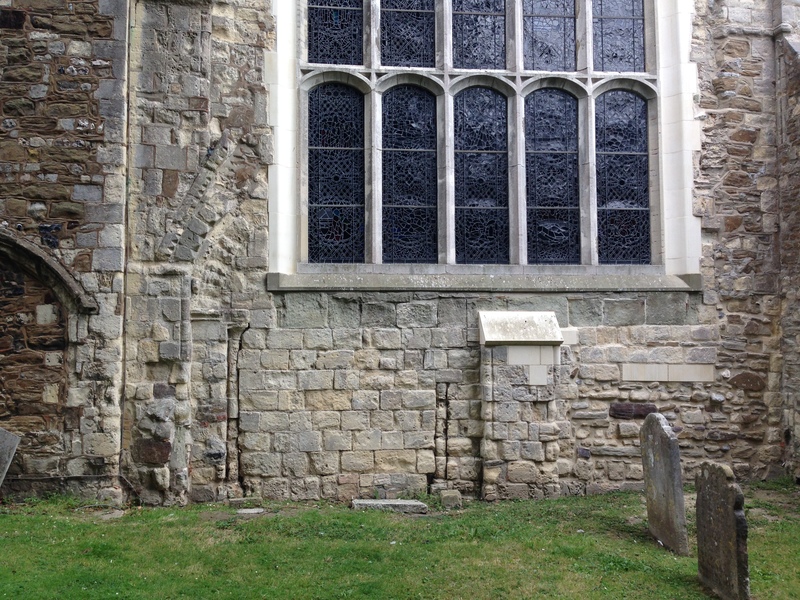 I’ve just noticed the outline of part of a Romanesque doorway, less visible than its similarly blocked later medieval neighbour, for the most part destroyed when an enormous fifteenth-century window was inserted into the south transept. The closer I look the easier it is to see the remains of not one but two doorways, a once substantial Romanesque portal, each with a pointed gable and carved decoration. 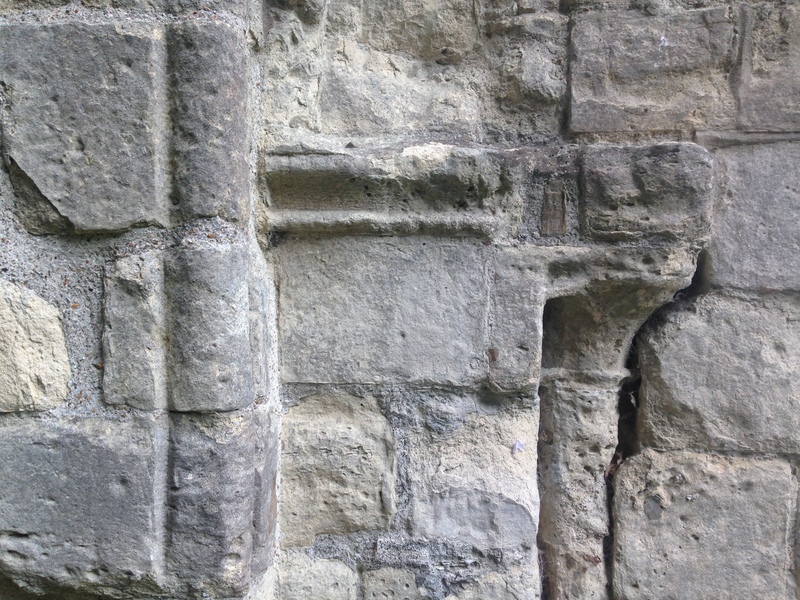 Most of the remains are weathered back into the stones but some stand proud: a column, a section of gable, part of a capital, all measuring the centuries of rain with their absent forms. 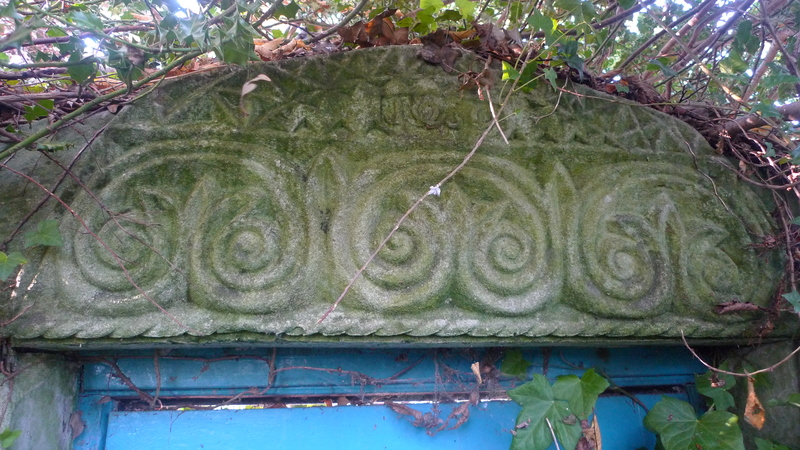 Some carved stones are reused as masonry. Before the decision was taken to chop most of it out to make way for the base of the window it was – if you follow the lines still just about visible – clearly impressive, and if of the same period as the nave arcades inside, with their gentle pointed arches and dogtooth ornament, just on the cusp of the Gothic proper. The trees are still, the air clean, with a mild taste of the sea. With the sun now gone, the low grey clouds set a chill and the outlines of the door almost disappear. 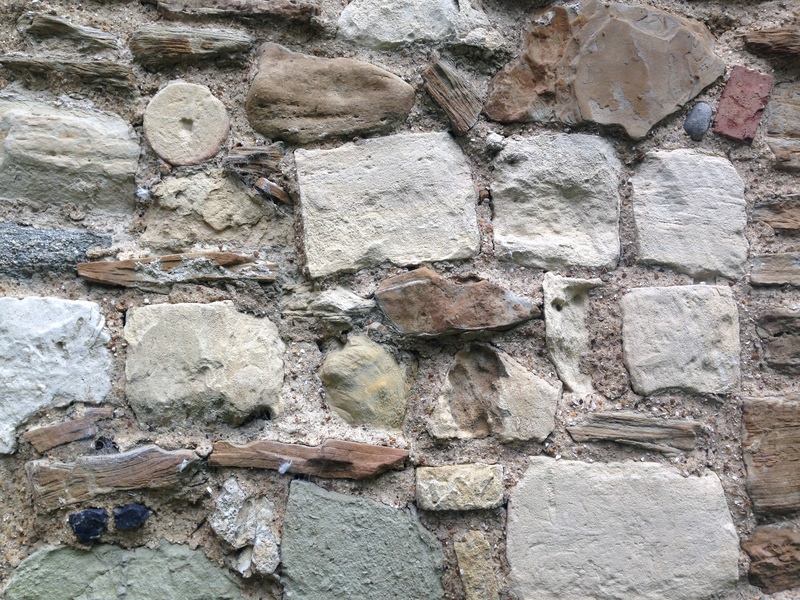 Doorways are destroyed, bricked up, lost, otherwise blocked, altering paths and routes through and around buildings, changing how that building has been experienced or understood through the centuries. Spaces are estranged, at once lost and made new at the same time. It’s interesting to think of the shadows of these now unused routes, the forced alterations of habits that a new door or a blocked door causes, a different way in or out, a new perspective. The excitement of finding a blocked and forgotten doorway is something I can attest to. Repairing a monument a few years ago in Exeter Cathedral we had to remove a number of stones to get to an iron cramp that had rusted, expanded, and because of this, was pushing part of the wall out of alignment. As we dismantled the ashlar it quickly became apparent that behind them, there was a change of infill material; the familiar stone gave way to brick. 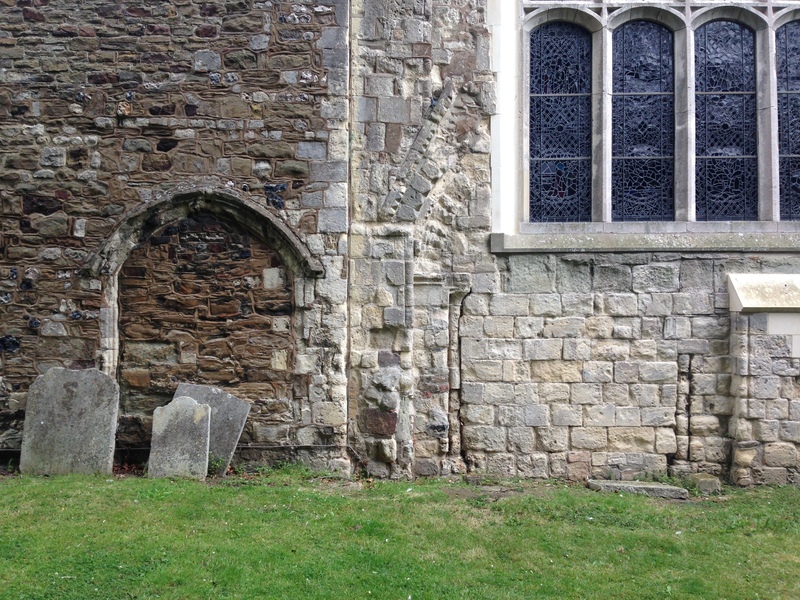 We’d found one edge of a former doorway, the door that once led from the north aisle to the Treasurer’s House on the cathedral green, itself long since destroyed. A doorway had been bricked up and the monument, placed there in the early nineteenth century, now covered its position. Old buildings, though, are symphonies of loss. This doorway in front of me, a whispered farewell to the Romanesque, destroyed by the work of later centuries and now remaining solely as a shadow on the stones, is a prime example. These gradual or sometimes dramatic changes must all find a new equilibrium with each other, must settle in, find new means of coexisting. Thinking about this I realise that conservation is about finding this equilibrium. In a sense the work of the conservator is really that of an intermediary between absence and presence, the job a means of anchoring the present to the past and to those who have come before. The repair of historic buildings then isn’t an unnecessary ‘extra’, an empty duty, or at least it shouldn’t be. It’s about sustaining and nourishing ourselves, of establishing a connection with place and the people who have made that place. It’s more than just a mark of respect for lost narratives and forgotten stories: it is material for new ones. A significant piece of Romanesque sculpture, moved from East Teignmouth church in the 1820s to the garden of a house in Dawlish, Devon, is still missing.